Traditions don’t travel from generation to g eneration on their own; it takes people to carry them forward through the years. 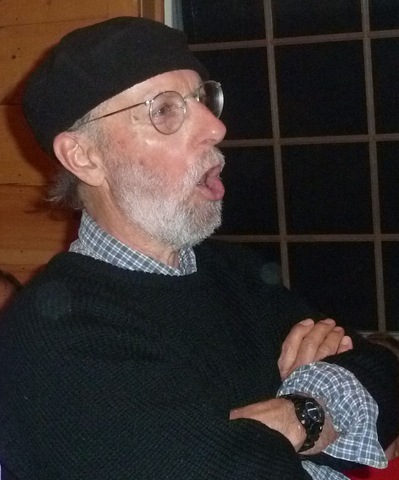 Dudley Laufman played that role in the world of traditional New England country dancing for the second half of the 20th century and now for a decade-and-a-half into this one. Today, with his partner Jacqueline, he shared some of his experience at the Canterbury Town Hall. 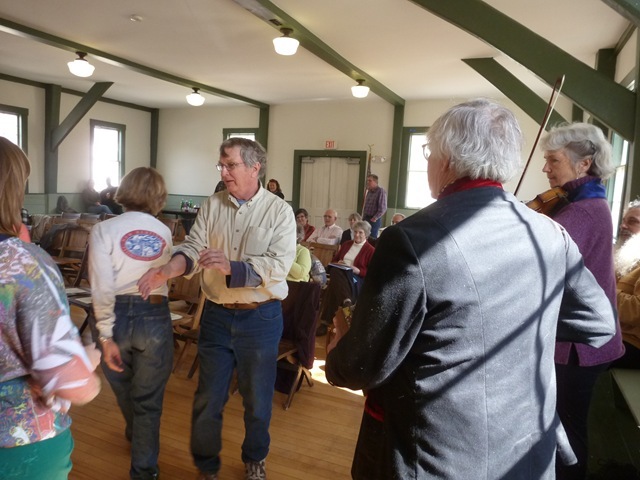 Dudley has been playing fiddle and leading dances for 64 years. 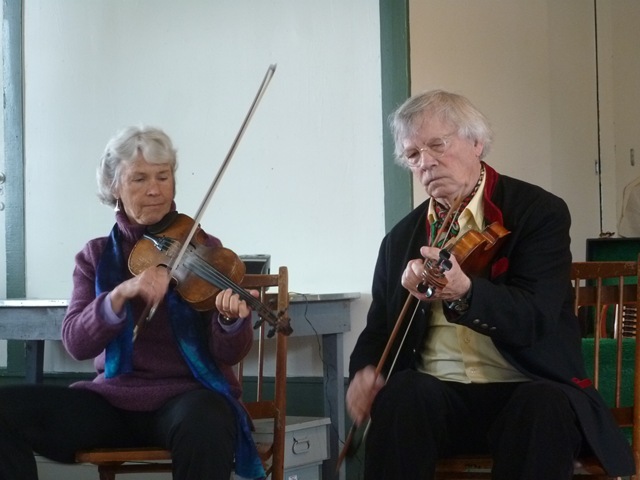 Speaking to about 35 people at a program sponsored by the town’s historical society with support from the NH Humanities Council, Dudley said he learned his trade from Ralph Page, a fiddler and dance caller from Nelson, New Hampshire, where Dudley attended an agricultural high school. Page learned from his uncle and from Happy Hale, who used to travel up to Nelson from the Greenfield, Massachusetts area. Dudley didn’t say how Happy Hale picked up the tradition, which dates from New England settlers in the 1600s. The first dances were held in homes, usually in the kitchen, which Dudley said was usually the biggest room. “The fiddle was the big instrument,” he said, but sometimes fiddlers would be joined by harpsichords, flutes, and cellos, especially in the homes of rich people. Tunes we know as “Muffin Man” and “The Bear Went Over the Mountain” w ere among those brought over from England and used for dances. Dancers knew the steps and passed them on to newcomers, according to Dudley’s version of traditional dance history. 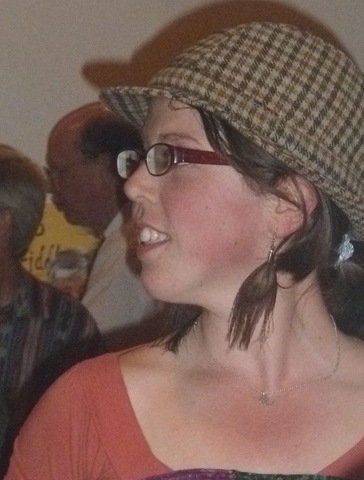 It wasn’t until the 1800s, when dances began taking place at larger venues like town halls, that dances started having callers, usually fiddlers. 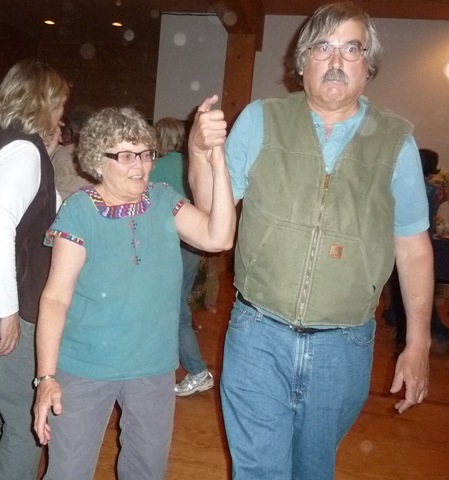 The style of dances Dudley leads are sometimes called “contra dancing.” The name derives from “country dancing,” as it was called back in the day. French dance masters learned the style and steps and re-named it “contra.” The name traveled back across the Channel and stuck. Since many dances are performed in opposing lines, “contra," which means “against,” seemed a fitting title. “That’s how I got hooked,” he said. 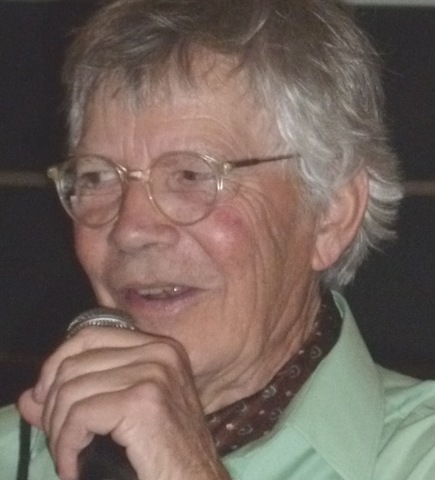 Dudley doesn’t get sole credit, but he played an essential role carrying the New England country dance tradition from the Ralph Page era, when callers learned the steps by observation and the music from playing, to the modern era. Page recorded the first albums of traditional New England dances in the ‘50s on 78 rpm discs. Dudley’s later recordings with the Canterbury Country Dance Orchestra were the first 33s. With Jacqueline, Dudley has written a book to teach the dances, mentored six apprentice callers, and led untold numbers of dancers through balances, swings, and promenades for six decades. 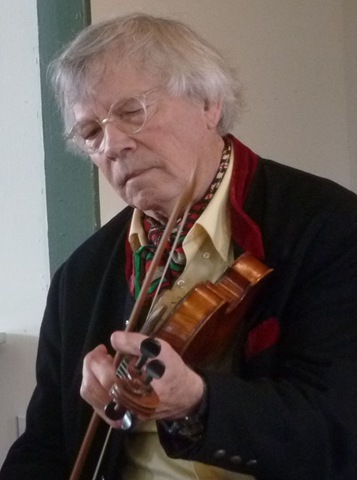 In 2009 Dudley was named a National Heritage Fellow, the nation’s highest honor in folk and traditional arts. 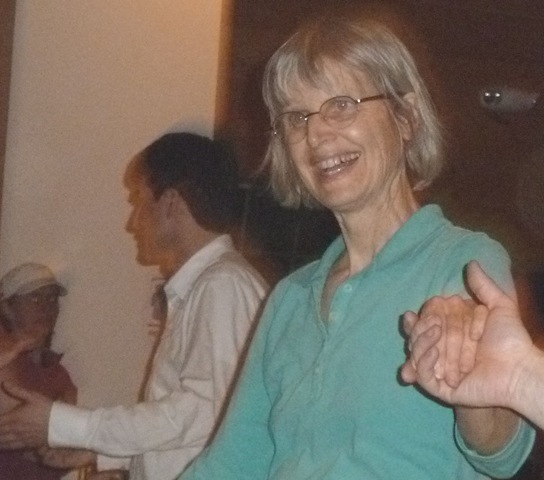 Unlike many lectures, Dudley’s presentation mixed tunes, stories, and poetry with stories, and finished up with a short dance. That’s how education ought to be! 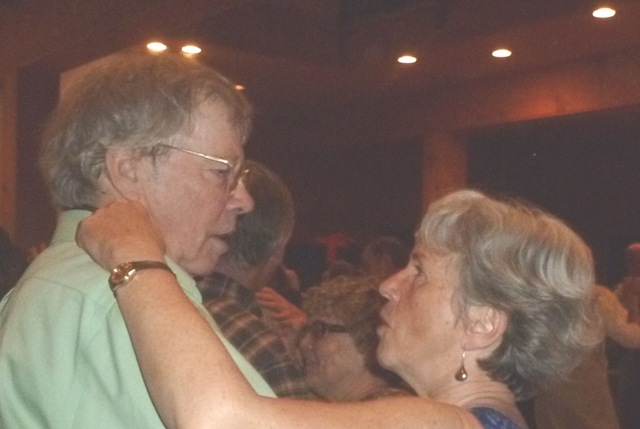 You can learn more and find dances schedules on Dudley and Jacqueline’s web site. 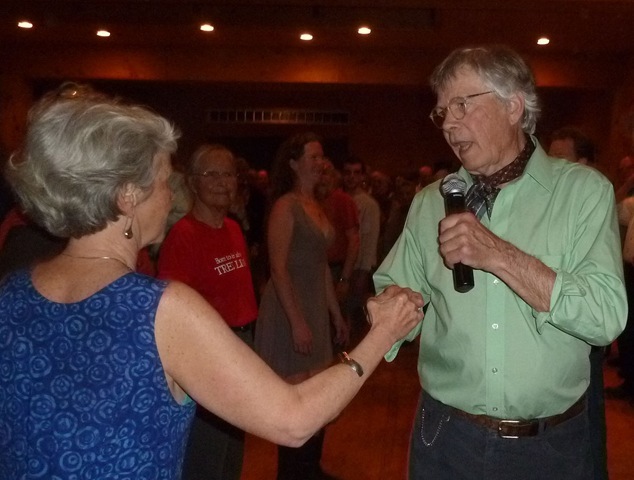 Dudley Laufman, who turned 80 a few months ago, finally got around to celebrating his milestone birthday last night with a couple hundred friends at a Sanbornton barn dance. 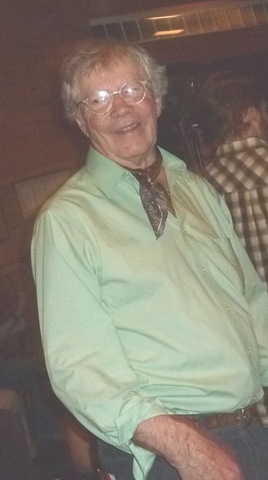 Dudley, who has been calling dances since 1948, mostly took the night off from calling, fiddling, and playing the accordion. Calling honors went to David Millstone, ably backed up by the Sugar River Band and other musicians who showed up with their instruments. 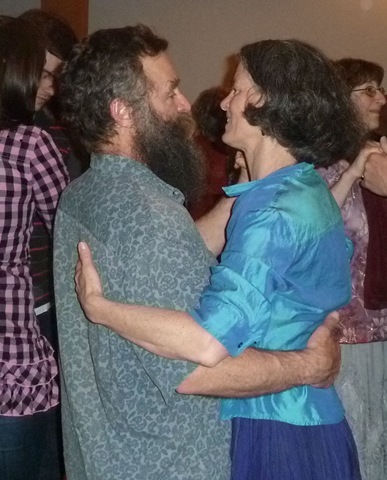 That meant Dudley was able to spend most of the evening dancing with his longtime Two Fiddles partner, Jacqueline Laufman. 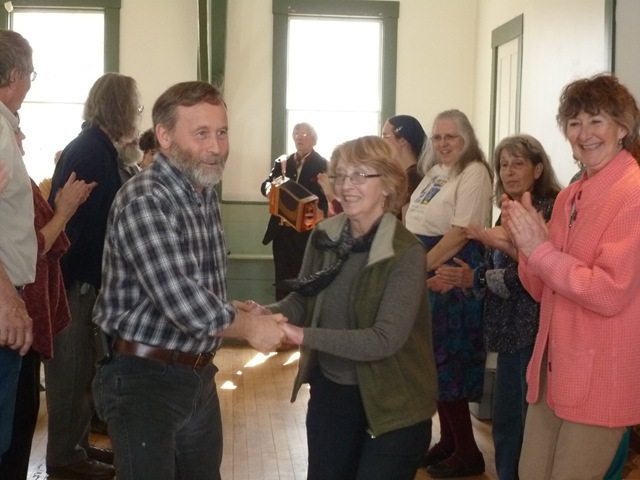 A legend in New England folk dance circles and beyond, Dudley was honored last year with the the nation’s highest honor in the folk and traditional arts: the National Heritage Fellowship, presented by the National Endowment for the Arts. The party was hosted by Lynn Chong and Rob Pearlman. Dancers included friends old and new, plus assorted children, grand-children, and other relatives of the honored guest. Dudley and Jacqueline are still calling and playing for dances. Look on their website for more information.